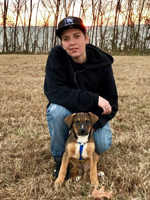 Chase Michael Bockman, 26, passed unexpectedly on Thursday, April 4, 2019. Chase spent most of his life in Hampton, where he was loved and cherished by everyone who knew him. He loved to travel, and experience everything the world had to offer. His favorite thing to do was to just cruise in his truck and listen to music, especially with his German Shepard puppy, Royal, or spend time with his mom, wife, and kids. He was exceptionally intelligent and creative, always noticing the “small things” in life. He could find the beauty in anything, and would go out of his way to help anyone, anytime. Chase was a loyal husband, father, son, brother, and friend. His infectious laugh and outgoing personality impacted everyone he crossed. He will be loved and missed by many. Chase will be joining grandparents in heaven, George Bockman, Jr., Alton Sapp and Jerry Thomas. Chase is survived by his wife, Katie Rose Bockman, daughter, Olivia Rose Bockman, godchildren, Nelson Keith, Maggie Lynn, and Ryleigh Emily, mother, Teresa Bockman, father, Richard Bockman and his wife, Amy Bockman, his sister, Taylor Bockman-Jacobs and her husband, Kevin Jacobs, brother, Tyler Bockman, grandparents, Jean Bockman and Mary Sapp, aunts, Shawn Bockman-Long and Margaret Bockman-Arnold, and uncle, Alton “Buddy” Sapp, puppy companion, Royal, as well as many cousins and friends.